Posted on October 12, 2017 at 7:01 pm. I understand now that there’s been, for over a decade-and-a-half, a controversy and a problem over the CHARAS building, and that the decision made a long time ago by the Giuliani administration was a mistake. For the Giuliani administration to put that building into private hands failed miserably, and we’ve seen the negative effect that that has had on the community. So I’m announcing tonight, the City’s interest in reacquiring that building. We are ready to right the wrongs of the past, and we will work with Council Member Mendez and her successor to get that done. 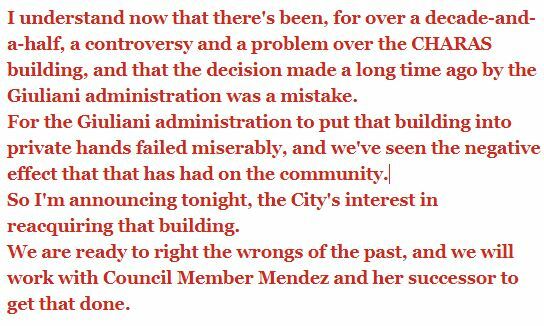 A thrill went through the Town Hall crowd that heard these words, and nothing can diminish the value of the Mayor’s public recognition of the truth. The East Village Community Coalition looks forward to working with the Mayor’s office, Council Member Mendez and her successor, Community Board 3, CHARAS, GVSHP, our coalition partners and our neighbors to see this cherished landmark returned to true community use.